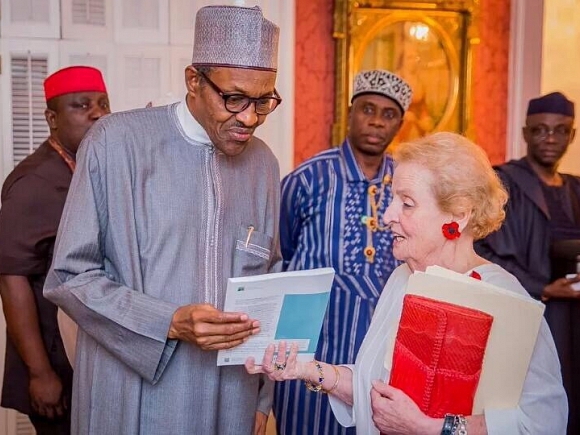 Madeleine Albright, the former U.S. Secretary of State, met with the new President of Nigeria, Muhammadu Buhari yesterday in Washington, D.C. and presented him with Confronting the Crisis in Global Governance, the new report from the Commission on Global Security, Justice and Governance. Secretary Albright, co-Chair of the Commission along with the former Nigerian Foreign Minister Professor Ibrahim Gambari, took the opportunity to highlight to President Buhari the report’s focus on fragile states, climate change and the global economy – all challenges Africa’s most populous country is currently grappling with. Their meeting coincided with a dinner hosted at Blair House, the official state guest house of the President of the United States, that was held in honor of the first state visit by President Buhari to the U.S. after his election earlier this year. During President Buhari’s visit to Washington, he met with President Barack Obama at the White House, where the two leaders had discussed countering the threat posed by Boko Haram and boosting ties between the U.S. and Nigeria.